Placing wedge shaped blocks underneath the hip area helps to balance the pelvis and relieve lower back pain. Holding specific points on the back of the head to gently relieve neck and shoulder pain. Knee pain and difficulty climbing stairs may be due to weakness in the thigh muscles. I can help this using gentle kinesiology techniques. Some people get pains and bloating after eating particular foods. I can find out exactly what food is causing a problem through muscle testing. 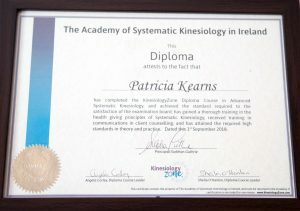 Hi I am Patricia Kearns owner of Sligo Kinesiology. I help busy people who struggle with chronic aches and pains on a daily basis. When we work together over a number of sessions my clients find they can move without pain, enjoy extra energy, sleep better and live life to the full again. Systematic Kinesiology treatment also helps people stay healthy and avoid illness. Through muscle testing I am able to find small problems in the very early stages and fix them before they become bothersome. Do you suffer with chronic lower back pain.? Does the pain settle down for a while but then flares up acutely? Does it strike suddenly when bending down, twisting or lifting something? When you have lower back pain it affects everything you do from walking to driving to housework and gardening. Simple everyday tasks require careful planning and lots of time. Using muscle testing I will check to find the root cause of the problem and treat it over a number of sessions so that you can move more easily and worry less about “minding your back”. Treatment involves massaging very specific points on the body through the clothing. I use the same methods for treating other areas of chronic pain such as shoulders, knees and hips. The muscle memory of old injuries remains in the body for many years after the injury happened. This restricts flexibility and causes stiffness. Using gentle Kinesiology techniques I can find these old injuries, release the muscle tension and help to restore normal flexibility. Do you ever feel exhausted and have to drag yourself around? Do you sometimes fee irritable and maybe even suffer from brain-fog? Due to the frantic pace of modern living many people are extremely stressed on a daily basis. In addition to the symptoms above stress can also cause indigestion. Aches and pains anywhere in the body can be brought on or made worse by being in a stressed state. By holding specific points on the forehead I can help to relieve stress without you the client having to talk about it or divulge any problems. After this treatment my clients have reported feeling lighter and freer than before. Phobias are deep seated and often irrational fears of things such as flying in an aeroplane, heights, spiders, dogs etc. I work with people to overcome phobias using gentle energy balancing methods. Do you ever get cramping pains, discomfort or bloating after eating? If so you may be suffering from a food sensitivity ….but to which food? 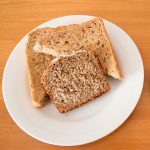 Are you concerned about having to give up almost everything you now eat and re-introduce them one by one over a number of months? With Kinesiology it is so much simpler. Using muscle testing I will find out the exact foods that are causing a problem. I do this by placing a small vial on the clients neck area and testing some muscles relating to the digestive system. Removing even one of these from the diet can make a huge difference to the way you feel within a very short time. I also check to see if any supplements or vitamins are needed to heal and support the digestive system. Best of all the results are instant so you know immediately what steps to take in order to enjoy your food in comfort again. I have suffered from painful knees for most of my life and as an example I was not able to kneel in a church without chronic pain and heat in my knees afterwards. Driving long journeys was also very unpleasant. The biggest issue for me in regards to the knees was the fact that it prevented me from enjoying the horse riding that I love. Over a number of months I had regular sessions with Patricia and I was delighted with the results. Both my knees have vastly improved and I can now enjoy long treks on the horse with little to no pain. Since 2011 I have suffered from cellulitis in my left lower leg. I had about 10 bouts of it including 2 stays in hospital on drips with a temperature of 104 degrees. The medical profession could only offer me antibiotics every time and after a 3 year wait to see a dermatologist I was simply told that it sometimes happens that a person can get recurring bouts of cellulitis and there was nothing more that could be done. I was having a very painful bout every 3 to 6 months and it was already resistant to one of the antibiotics I had been using. Part of the service Patricia offers is testing if various types of nutritional support would help with a certain condition. I am not going to deny I was very sceptical as I felt nothing could be done, however the results have amazed and delighted me too. I am taking the supplement she recommended every day and have been free of cellulitis for over a year and I feel great. Each person is different so I am not mentioning the particular supplement I take because another person with the same condition could require something else to help them. My life has been transformed by not having bouts of cellulitis anymore and simple things like being able to wear shorts, a skirt or dress have once again been possible as I am no longer embarrassed by the look of my leg. The pain is completely gone and the mark on my leg is barely visible anymore. Hi I haven’t drank milk since I saw you 6 weeks ago and my skin is perfect! Can’t believe it! I trained as a Systematic Kinesiologist because I personally found that this was the only therapy that got to the root cause of my long standing chronic back pain. It also fixed an old shoulder injury and resolved cramps and pains I had due to food intolerance. I was so impressed with my own results that I felt a strong desire to bring this therapy to other people. I now work from my home near Ballygawley Co Sligo (approx. 20 mins from Sligo town). A treatment session takes one hour and I highly recommend a course of three sessions. 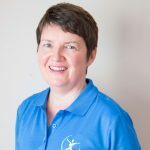 To find out how Systematic Kinesiology treatment can help you just send me a message using this contact form and I will get back to you to organise a short phone conversation.